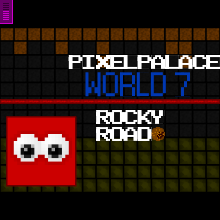 Here it is, World 7, the next to last world of the main story in the PixelPalace series! In this game, you find yourself in a dark rock mine where you will be subjected to crazy level designs and more. With rocks falling from the ceiling, digging through rocky ground for gold, and blowing up rock with dynamite, this cave really puts the Rock in Rocky Road.